NASHVILLE, Tenn. (AP) — Tennessee Senate candidate Phil Bredesen says of the northbound migrant caravan in Mexico that a "few thousand poor people" aren't a threat to the United States' security. The Democratic former governor told WCYB-TV on Wednesday the U.S. is the strongest country in the world, adding he wants strong border security. 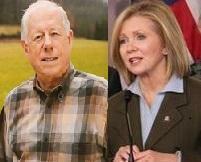 Bredesen's Republican opponent, U.S. Rep. Marsha Blackburn, has called the caravan an "illegal alien mob" at the border, even though the caravan is in southern Mexico — far from the U.S. border. Blackburn is opposed to so-called sanctuary cities and supports President Donald Trump and his plan for a wall along the U.S.-Mexico border. Trump has targeted the caravan to highlight his hardline immigrant policies.